In May 2011 Andorra became a member federation of the EHF. This weekend the national team had their first international match ever. At the 11th Extraordinary EHF Congress, that took place on 29 May 2011 on the occasion of the VELUX EHF FINAL4 in Cologne, Germany, Andorra’s National Federation’s application was granted by majority vote. This made them the 50th member federation of the EHF with immediate effect. 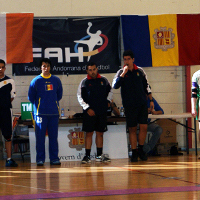 On Friday 7 October 2011 the time had come for the very first match of the newly formed Andorran men’s national team. They played host to the national team of the Republic of Ireland. A remarkable crowd of 350 spectators in the hall witnessed the young guns of the Andorran side – the average age was 19 years old – start the game very strong. With loud support from the stands their fast and effective game-play gave the home team a comfortable 8-3 lead after ten minutes. But the experienced Irish team woke up and began to close the gap goal by goal. They managed not only to equalize the score but even to take a one-goal lead to the dressing rooms at half-time. Also second half saw a lot of good combinations and great shots from both teams while the score was quite equal for a long time. Eleven minutes before the end of the game, Ireland had managed to gain a four-goal margin and seemed to have good cards for winning the game. But the Andorran team showed a fantastic team spirit and fought back goal by goal. With a tremendous effort they equalised the score and brought the game to the edge. The finish was a thriller: exactly four seconds before the final whistle, a penalty was given to the Irish, who scored to win the match 30-29. Still the atmosphere was overly cheerful; players, fans and officials were all overly pleased with their first international appearance. The proud president of the Andorran National Federation, Gerard Pifarré Ros, said after the game: "It was a fine game. The result – losing by one – was more than acceptable. Especially the spirit of Fair Play during the match was really fantastic."